Britannia Aircraft Preservation Trust: Aircraft paint stripping completed!! 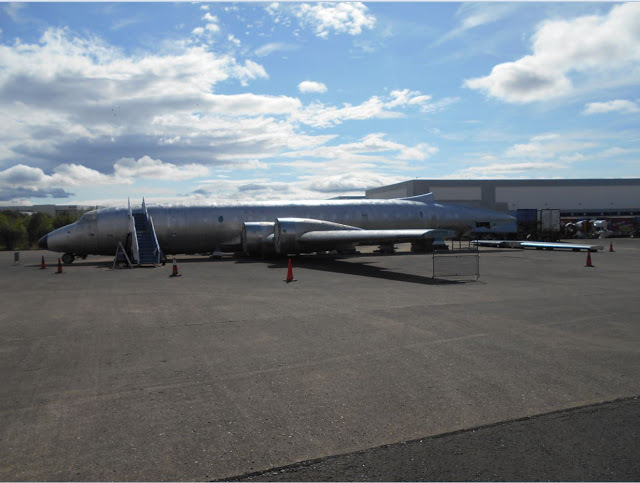 In August this year, a major milestone was reached with the completion of the removal of the many layers of old paint, and the subsequent rubbing down of the fuselage. This process had been on-going for several years. Its completion now means that in the very near future, fresh primer can finally be applied. Even though the aircraft is sitting on trestles, it was still necessary to use long ladders to reach the top and roof and this proved a challenge keeping in mind the needs for adequate health and safety measures for the volunteers. It took a long time to remove the paint due to the sheer size of the aircraft, as well as the weather conditions on the day, which dictated how effective the paint stripper would be. It was not possible to use if it was too cold, thus reducing the number of work days we could do this work. Even when the weather conditions were perfect, the paint stripper was still more effective in some area's than others. A scraper was also used to try and remove any odd bits of paint in those areas which proved more stubborn. Rubbing down the fuselage after this had been done involved the use of Scotch-Brite, as well as wet and dry rubbing. These were systematically soaked in sugar soap diluted in water. After this, the pressure washer was used to wash that area off, then the process started again on another area. With all the effort and hard work, the completion of the paint-stripping was finally achieved in August. What a fantastic result as you can see in the photos below.